For those who remember the Berliner Ensemble’s extraordinary Richard II, which came to the UK in 2006 as part of the RSC’s Complete Works Festival, Joe Hill-Gibbins’s new production of the play for the Almeida may have struck a chord. 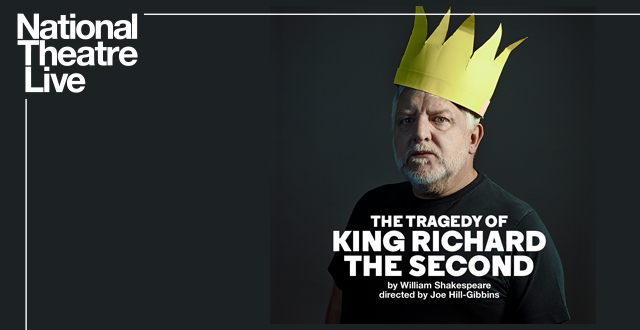 As with that production, this stripped back Richard II – barely 90 minutes long without interval – offered a concentrated version of the play that subjected its title character to extraordinary indignities while exploring the constrained nature of power. Simon Russell Beale’s Richard began the play, standing in near darkness in a three-sided metal box with no entrances or exits (design by ULTZ). Shadowy figures stood against the back wall as Richard spoke the soliloquy from his prison scene, setting up the stage as a manifestation of that prison, in which he and his subjects were trapped. Given that I happened to be watching this while (yet) a(nother) crucial Brexit vote was going on in Parliament, the sense of the lawmakers all rattling around together in a space with no escape had not a little potency. Hill-Gibbins’s script (with dramaturgy by Jeff James) offered a deep cut of the play, keeping highlights and the broad narrative while making intuitive changes to streamline characters and keep the focus on Richard. In many ways, in fact, the production shared several hallmarks of Cheek by Jowl’s work: the ever present ensemble who slipped fluidly between characters and chorus roles; the visibility of characters as they were spoken of; the single set with lighting changes to shift between different spaces. It lacked the elegant movement work of my favourite company (indeed, unusually, no Movement Director was credited in the NT Live flyer), but shared the interest in getting to what mattered. Russell Beale was an unusually mature Richard, but that exaggerated a key theme of the production – arrested development. Trapped together in this large metal box, the ensemble came across primarily as overgrown children, with Richard slowly realising that he no longer ran the playground. This wasn’t played as childishly as that may sound – while there were instances of toddler-like tantrums and playground fighting, the childishness manifested more as a limited set of emotional responses, a tendency for characters to flip wildly between extremes of mood and over-invest in one another. This was even more so true of Leo Bill’s Bolingbroke, whose posturing in his opening conflict with Mowbray involved him holding up a gage with arm straightened as if desperate to be seen across the playground; and his later snap judgements and vicious temper led to some of the more violent moments. Richard’s tendency to make snap judgements and immediately adopt the worst case position made sense in this reading. Early in the play, he enjoyed the power he wielded; one important change saw Gaunt (Joseph Mydell) survive past his death in the play to take York’s lines as Richard confiscates Gaunt’s lands. Richard knelt with the dying Gaunt, telling him to his face that he was going to take all he owned, in an extraordinary scene of vindictive cruelty. And next to Bill’s unusually nervy and immature Bolingbroke, Richard’s self-possession always commanded respect, even while wearing a cardboard crown and black t-shirt. As Richard’s new status sank in, Russell Beale dug deep to find sympathy, making the character classically Bealean while keeping focus on the exploration of assumed privilege. Richard’s withering asides and bathetic remarks kept some humour, but what Russell Beale conveyed more than anything else was lostness – his wide eyes as he asked why his subjects weren’t kneeling; his repressed anguish and rage as Bolingbroke knelt to him; his brief outburst of shock at hearing that Barbary was proud to carry his rival. In one especially fine moment, as Bolingbroke knelt before him, Richard knelt too and embraced him, but his voice took on a hard edge as he told Bolingbroke that he knew how high his heart aspired. Bolingbroke leapt to his feet, leaving Richard kneeling before him, and Russell Beale’s expression of regret and foolishness as he realised he’d been beaten was pitiful. The stage began pristine, with a few ominously labelled buckets – ‘soil’, ‘water’, ‘blood’ – clustered at the edges. In the moments most reminiscent of the Berliner Ensemble production, the contents of the buckets defiled the stage and its inhabitants. It’s an old device, but undeniably effective, especially as, on his return to England, Bolingbroke worked himself up to a screaming rage before throwing the bucket of blood all over Bushy and Bagot. In another interesting set of decisions, Richard took the lines of his wife (not present) in two scenes of torture presided over by Robin Weaver’s Northumberland. In the first, the Gardeners entered and spoke their lines as mocks of the king, before throwing buckets of soil and water over him. In the second, Bolingbroke’s triumphant entry was described while Richard was anointed with piles of soil. Left filthy and shivering in the mud, Richard cut a tragic figure, embodying his state of ruin. The ensemble worked well together. While, as noted, the group movement didn’t have the fluency that usually characterises this style of work, this perhaps helped developed the ramshackle, playground-like tone. For much of the production the watching actors clustered very close together, making characters force themselves out from among one another, and leading to some extremely intimate brawls as members of the cluster fought with one another. At its best, the clustering worked to emphasise the speed at which nobles turned on one another – when Bolingbroke ordered Bushy and Bagot to be brought forward, the group huddle twisted round so that those two were suddenly being held by the others. All of this was also caught well on camera. The intimate environs of the Almeida limited the camera angles rather more than usual for an NT Live broadcast – meaning that we also saw a lot more of the backs of the audience’s heads, from a master shot towards the back of the stalls – but these group moments, often played out at extreme downstage, were perfect for cinema, capturing every nuance of the snarling faces. There was a lot of comedy in the ensemble sequences, too. The reliably comedic gage scene – with Marins Imhangbe’s Aumerle at the centre of the flying gloves – began formally, but descended into farce as characters first started slapping one another in the faces with their gages, and then began flying about the stage (John Mackay’s York even doing commando rolls as he chased one opponent) which Bolingbroke had to scream to be heard over. And Mackay and Saskia Reeves (just splendid throughout) did some good work as the Duke and Duchess of York in their pleas to Bolingbroke on behalf of/against their son, Mackay even breaking momentarily out of character to shout at the Duchess to ‘shut up!’ as she pounded on the steel walls. A special shout, too, to Natalie Klamar’s Herald, whose manic delivery of the announcements of Mowbray and Bolingbroke at the start set the tone hilariously for the more playground-like scenes. But this really was Richard’s show, and the state of the bedraggled former king by the play’s end was powerful. Perhaps more powerful, though (and very Cheek by Jowl-ish), was the long sight of first Bolingbroke and then Richard, crouched down centre stage while they were ‘absent’ for stretches of the play. Never in my memory has a production of Richard II succeeded in making ‘this sceptr’d isle’ (and yes, let’s please not forget that England is a long way from being an island by any definition) seem so much like a prison. The sight of feuding people destroying a country while cooped up in self-imposed borders seems remarkably prescient just now, but the Almeida’s staging effectively drew attention to the implications of acts on those who are not present as well as those who are. In many ways this was a cold production in its technical interests, and yet at the centre of it seemed to be a plea for empathy.